Not so great news this week for Imperial Beach and National City. The Union Tribune reported that although San Diego has recovered from the 2008 recession, these two cities haven’t. The study assigned a distress score on a scale of 1 to 100, and although Chula Vista had a distress score of less than 10, National City scored 80.6 and Imperial Beach scored 85.1. The ratings factored in earnings, the poverty rate and lack of high school degrees. Southwestern Community College is awash in racism, according to the school’s newspaper. The new Equity, Diversity and Inclusion Committee (EDI) Director, Dr. Guadalupe Rodriguez Corona, postponed the first-ever meeting of the committee because she thought it had “too many African-Americans.” Now, people are calling for her resignation, although Corona denies making the statement. Chula Vista plans to create a tourist hotspot on its western bayfront. SD Metro reported this week that Pacifica just closed escrow on 95 acres located within the Sweetwater District of the Chula Vista Bayfront. They plan to develop a 1,500 unit residential complex with an additional 15,000 square feet of ground floor retail, a 250-room hotel, and 420,000 square feet of offices space. According to the Union Tribune, Imperial Beach again OKs medical marijuana to be cultivated by certain individuals for certain patients, while continuing to ban commercial production and local dispensaries. IB’s sister cities of National City and Chula Vista in recent months also voted against medicinal marijuana shops. A new Imperial Beach newspaper, IB Connection, is working with an online newspaper, DigImperialBeach.com, to deliver a print copy of IB’s local news in March. Imperial Beach is asking residents for their input on what to do with their 9,500 square foot empty lot at Date Avenue. The meeting is set for March 22. The Tijuana River National Estuarine Research Reserve (TRNERR), along with its partners, received funding of $689,500 to address coastal flooding and sea level rise in Imperial Beach, Carlsbad and Del Mar. The project is one of only six grants awarded out of a pool of 150 national proposals, and is the first West Coast project to receive funding from this landmark federal program addressing coastal climate hazards. Kimball Park is set to get a skate park along with several other upgrades. It’s all part of National City’s continued program to revitalize many parts of the city. The Bonita Museum & Cultural Center will open a San Diego Legends exhibit from March 2 through April 9. Recognizing local elders, the exhibit will display painted portraits and photographs. Sal Barajas, one of the original Chicano Park muralists, and Aurora Cudal, a Filipino-American community activist, will be interviewed as well. Speaking of art: the swath of land from Barrio Logan to Agenda Revolución is the hottest Latino modern art corner of the world. San Ysidro knows it and Chris Sanchez, Chairman of the newly formed Border Public Arts Committee, is looking for ways to feature artists along San Ysidro Boulevard and other spots within the neighborhood. He also has Manu Favela on his team. Their committee meetings are open to the public, and the next one takes place on Saturday, March 5th at 11 am at the Duty Free City of 601 E San Ysidro Blvd. As developers continue to eye the open land in Otay Mesa as well as eastern Chula Vista, the San Diego County Board of Supervisors voted unanimously to permanently let local builders and businesses delay paying traffic, park, sewer and drainage fees until their projects are finished. Meant to boost building and the local economy, the deferral program helps builders start projects that they otherwise might put off due to the cost of upfront fees. 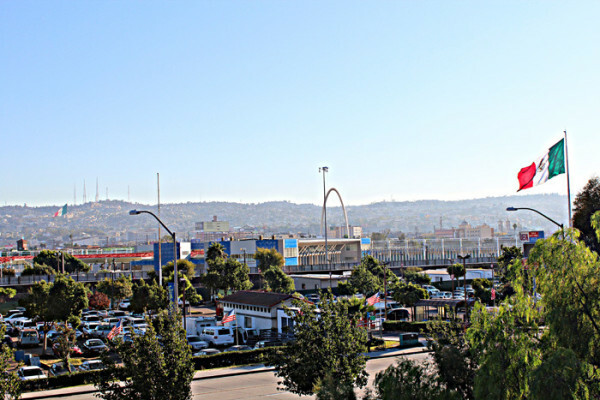 Tijuana receives a large share of American patients each year who cross for lower cost medical care. To meet demand, the owners of New City Medical Plaza are planning to build a 26-story high rise right next to the border that will have doctors offices, a medical lab, a surgery center and a 140-hotel right. The intent is to better accommodate the 1 million U.S. citizens who cross annually for health services, 85% of which come from Southern California. And lastly, a little further afield, check out The Atlantic article about Eastern European cactus smugglers at the border. « When Does the Violation of Women’s Bodies Become a ‘Red Line’? It usually costs 3 times as much for dental procedures here in the US as it does in Mexico. And the dentists speak English and are every bit as proficient.